Disclaimer: Futures, Options, and Currency trading all have large potential rewards, but also large potential risk. 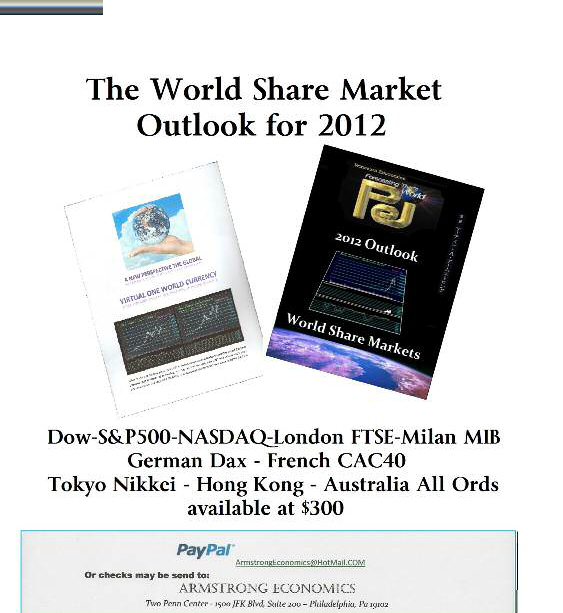 You must be aware of the risks and be willing to accept them in order to invest in these complex markets. Don’t trade with money you can t afford to lose and NEVER trade anything blindly. You must strive to understand the markets and to act upon your conviction when well researched. This is neither a solicitation nor an offer to Buy/Sell futures, options, or currencies. No representation is being made that any account will or is likely to achieve profits or losses. 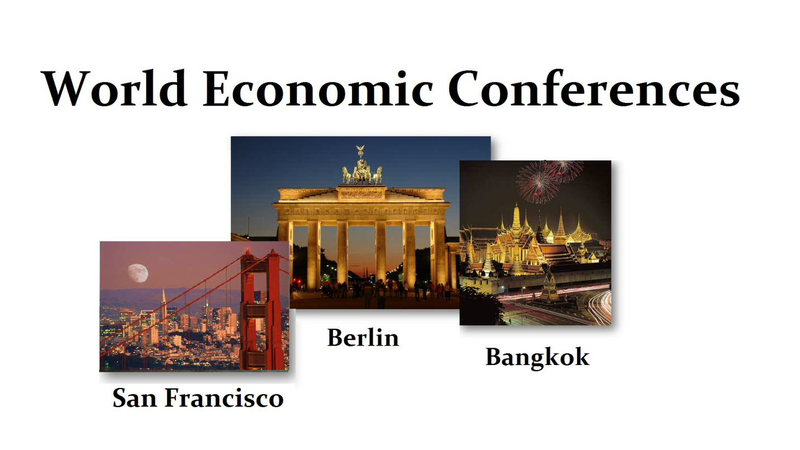 Indeed, events can materialize rapidly and thus past performance of any trading system or methodology is not necessarily indicative of future results particularly when you understand we are going through an economic evolution process and that includes the rise and fall of various governments globally on an economic basis. It should not be assumed that the methods, techniques, or indicators presented in this publication will be profitable or that they will not result in losses since this cannot be a full representation of all considerations and the evolution of economic and market development.. Copyright 2012 Martin A. Armstrong All Rights Reserved. Protected by copyright laws of the United States and international treaties. This report may NOT be forwarded to any other party and remains the exclusive property of Martin Armstrong and is merely leased to the recipient for educational purposes. 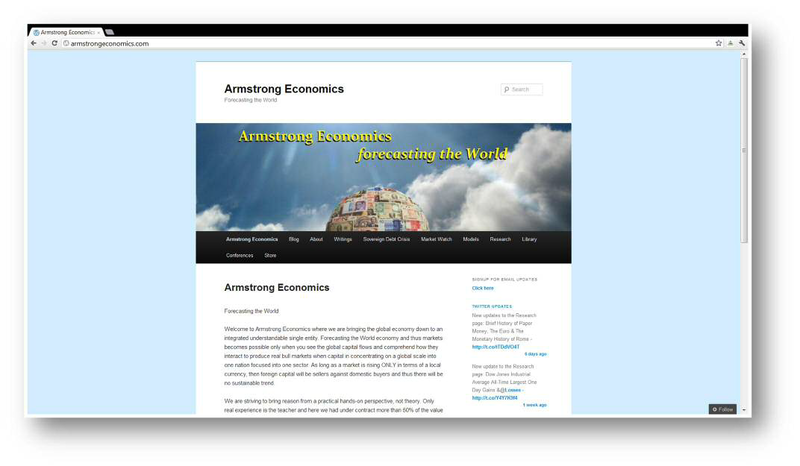 We have been constructing our Public Service Website with a historical archive of previous reports and essays on our economic and model research. In addition, you will find a free library of major economic works, the history of interest rates, Monetary System and much more. We will be providing our forecasting services shortly and much of our historical and political research will remain as a public service. One of the fascinating aspects of all the controversy about paper money v hard money, has been the lack of knowledge of just how did it come about? 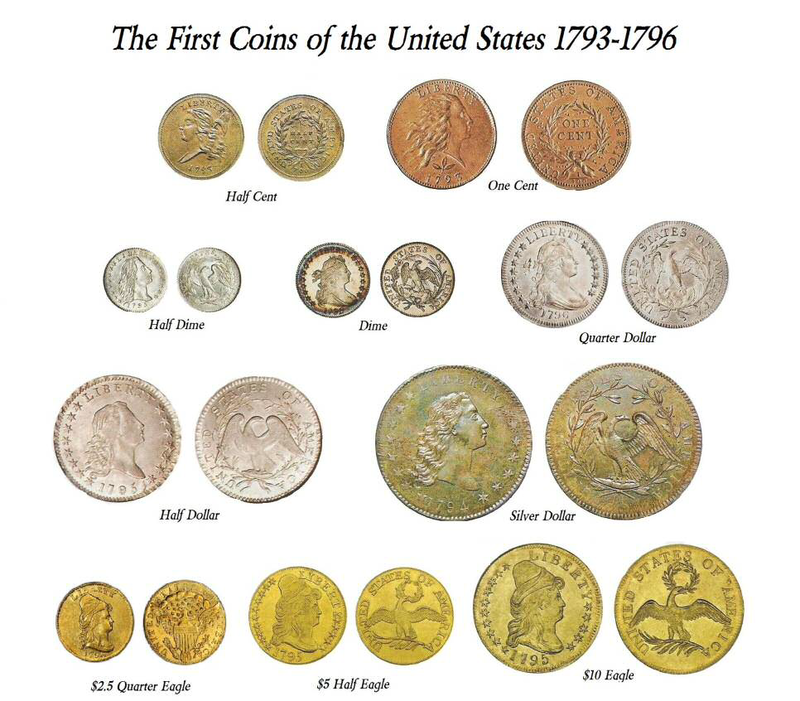 Oh we can go back to paper money being a receipt from bullion dealers offering money storage, and we can go the American Colonial Period and point to the drastic shortage of coin that necessitated paper money issues. But those stories are fairly common knowledge. What isn t talked about even in school is the manipulation of the Supreme Court AFTER it declared that PAPER MONEY WAS UNCONSTITUTIONAL! The Legal Tender Cases were a series of United States Supreme Court cases in the late 19th century dealing with the constitutionality of paper money. In the 1870 case of Hepburn v. Griswold, 75 US 603 (1869) the Supreme Court had held that paper money violated the United States Constitution. The reasoning expressed in this decision is still relevant today. Of course, there is no rule of law in the United States because judges are appointed for life by political interests. Today, it is a rare judge indeed who will defend the constitution or the right of the individual over that of the government. Most are former prosecutors or judge s clerks, and there is hardly ever anyone appointed from the real people. Consequently, the constitution has lost all it’s worth and meaning. The Hepburn Case primarily involved the constitutionality of the Legal Tender Act of 1862 that had been enacted during the Civil War. 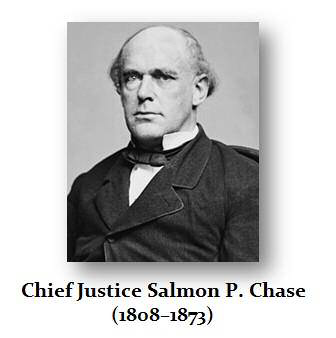 In Hepburn, Chief Justice Salmon P. Chase held only for a 4-3 majority of the Court that the Act was an unconstitutional violation of the Fifth Amendment. Ironically, Chief Justice Chase had played a role in formulating the Legal Tender Act of 1862, previously when he was Secretary of the Treasury. This merely demonstrates that a governmental person if honest, merely argues whatever will benefit the government regardless whether that is correct. Once Chase was Chief Justice, he struck down the very Act he championed. Nevertheless, the corruption within politics is just too great for the people to ever have a fair and honest way to manage society. 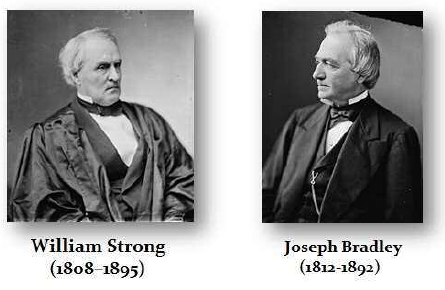 On the very same day that Hepburn case was announced, President Ulysses Grant nominated two new justices to the Court, Joseph Bradley (1812-1892) and William Strong (1808-1895), who would overturn that decision. Indeed, Bradley and Strong subsequently voted to reverse the Hepburn decision, in Knox v. Lee and Parker v. Davis, again on a one vote majority 5-4. The constitutionality of paper money was thus established thirteen years later in Juilliard v. Greenman. The lawsuit that started the whole affair originated when one Mrs. Hepburn attempted to pay a debt due to one Henry Griswold on a promissory note, which was made five days PRIOR to the issuance of United States Legal Tender Notes central to this case. Griswold sued Hepburn in the Louisville Chancery Court on the note and refused Mrs. Hepburn’s tender of United States notes to satisfy his claim. She then tendered the notes into the chancery court, which declared her debt satisfied. The Kentucky Appellate Court of Errors reversed the lower chancery court’s judgment holding that the notes were not valid for payment, and Mrs. Hepburn appealed to the United States Supreme Court. Most likely, there were powerful interests backing the lawsuit on each side because otherwise it would not pay to appeal such a case looking at the legal fees involved. The Supreme Court then affirmed the judgment of the Court of Errors. From a practical perspective, Mrs. Hepburn could have easily exchanged the notes elsewhere and provided the appropriate funds due. Clearly, nothing of the sort was done because this issue was ripe to be decided. The U.S. Supreme Court indeed acknowledged that the Federal Constitution of the United States is the highest law of the land and that the national government was powerless to do something that it was not authorized to do by the people. The Federal government holds the power to do things that are not expressly granted in the Constitution, so long as they are incidental to it. The Hepburn Court went on to explain how the United States Congress has the power to coin money. However, the Court held that the power to coin money was distinctly different from the power to make paper legal tender. Indeed, we can see plainly from Article I, Section 10 that the Constitution did not authorize paper money. Indeed, no paper money was ever issued by the United States until the Civil Way in 1861. That means that for the first 69 years, there was no government paper money. The first issue was that shown above in 1861. However, a demand note is simply a recipt. It does not purport to be money itself. That is where the formal declaration of 1862 declared paper money directly to be Legal Tender for all debts public and private. 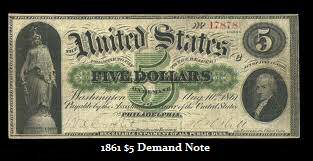 The Court discussed that the government holds the power to carry on war and since these demand notes or greenbacks were issued to finance the American Civil War, perhaps Congress could make these notes legal tender under that power if they were incidental. Nevertheless, the Court reasoned that making notes legal tender was not necessary to carry on war. Clearly, the reasoning is straight forward. There are no tricks or clever manipulations of words. 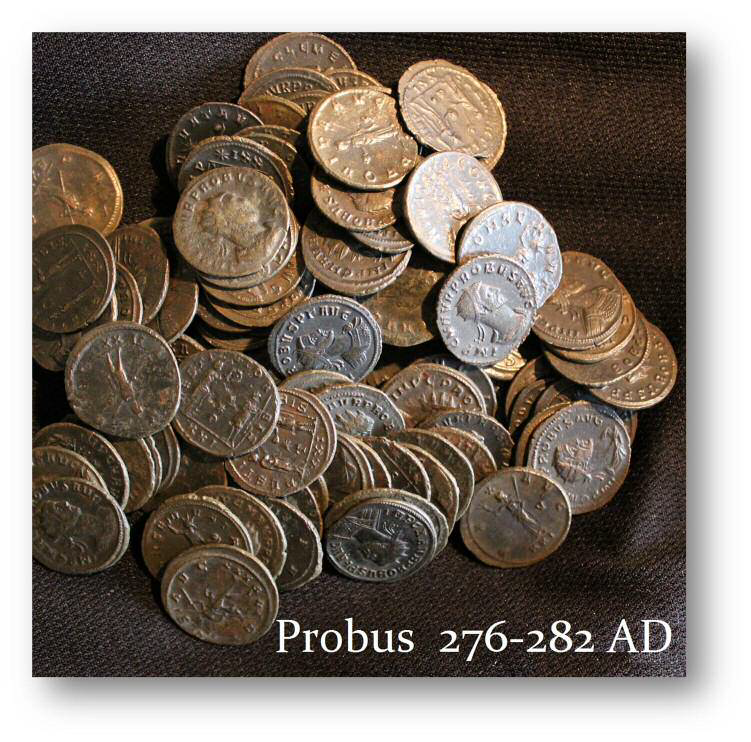 Paper Currency existed both at the state and federal level. It is hard to reason that expressly stating that money should only be coin somehow leaves the window open for paper money when the Founding Fathers were well aware such currency existed. It is one thing to issue paper money that paid interest. This was a form of circulating bond. It was also distinctly different to issue a demand note that merely guaranteed that the Treasury had the coin on hand and would redeem the note at any time. However, it was an entirely different animal to then create a note and call it legal tender for it was now money no different than coin itself. As long as the paper paid interest or could be redeemed for coin, it was NOT money directly itself. The Hepburn Court in 1869 also talked about how the Constitution prohibits the several states from impairing the obligations of contracts or coining its own money. It court concluded that although there is no such express prohibition against the federal government, it would violate the spirit of the Constitution for the federal government to assume it could violate those very same principles. The Latin maxim expressio unius est exclusio alterius is a doctrine of statutory construction that is supposed to inform a judge how to interpret a statute. It states that the mention of one thing in a statute impliedly excludes another thing. Generally, the expression of one or more items of a class when specified implies that those NOT identified are to be excluded. Likewise, the inclusio unius est exclusio alterius doctrine states that when a law expressly describes a particular situation in which something should apply, an inference must be drawn that what is not included by specific reference was intended to be omitted or excluded. Since the Constitution expressly states that no state shall make any Thing but gold and silver Coin a Tender in Payment of Debts it would be impossible to be carried out if the federal government were excluded. Contracts for the payment of money, made before the act of 1862, had reference to coined money, and could not be discharged, unless by consent, otherwise than by tender of the sum due in coin. Every such contract, therefore, was in legal import a contract for the payment of coin. There is a well known law of currency that notes or promises to pay, unless made conveniently and promptly convertible into coin at the will of the holder, can never, except under unusual and abnormal conditions, be at par in circulation with coin. It is an equally well known law that depreciation of notes must increase with the increase of the quantity put in circulation and the diminution of confidence in the ability or disposition to redeem. Their appreciation follows the reversal of these conditions. No act making them a legal tender can change materially the operation of these laws. Their force has been strikingly exemplified in the history of the United States notes. Beginning with a very slight depreciation when first issued, in March, 1862, they sank in July, 1864, to the rate of two dollars and eighty-five cents for a dollar in gold, and then rose until recently a dollar and twenty cents in paper became equal to a gold dollar. Admitting, then, that prior contracts are within the intention of the act, and assuming that the act is warranted by the Constitution, it follows that the holder of a promissory note, made before the act, for a thousand dollars, payable, as we have just seen, according to the law and according to the intent of the parties, in coin, was required, when depreciation reached its lowest point, to accept in payment a thousand note dollars, although with the thousand coin dollars, due under the contract, he could have purchased on that day two thousand eight hundred and fifty such dollars. Now it certainly needs no argument to prove that an act compelling acceptance in satisfaction of any other than stipulated payment alters arbitrarily the terms of the contract and impairs its obligation, and that the extent of impairment is in the proportion of the inequality of the payment accepted under the constraint of the law to the payment due under the contract. Nor does it need argument to prove that the practical operation of such an act is contrary to justice and equity. 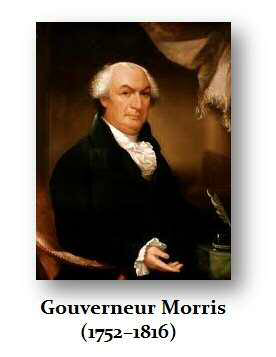 It follows that no construction which attributes such practical operation to an act of Congress is to be favored, or indeed to be admitted, if any other can be reconciled with the manifest intent of the legislature. What, then, is that manifest intent? Are we at liberty, upon a fair and reasonable construction of the act, to say that Congress meant that the word “debts” used in the act should not include debts contracted prior to its passage? We can see what the law was and how the Supreme Court should have ruled. Since compelling somebody to accept something other than what was contracted for was a taking of property, the Court found that making notes legal tender was a taking without just compensation and without due process of the law. but not in source or in limitation. They all arise from the Constitution, and are limited by its terms. It is the function of the judiciary to interpret and apply the law to cases between parties as they arise for judgment. Page 75 U. S. 612 legislative provision with the fundamental law, it is the plain duty of the court to compare the act with Constitution, and if the former cannot, upon a fair construction, be reconciled with the latter, to give effect to the Constitution rather than the statute. This seems so plain that it is impossible to make it plainer by “will administer justice without respect to persons, and do equal right to the poor and the rich, and faithfully perform the duties incumbent upon him to the best of his ability and understanding, agreeably to the Constitution and laws of the United States,” becomes an idle and unmeaning form. The dissent argued that the government was threatened by the war and making the notes legal tender provided the government with the necessary supplies to continue to fight the war. Therefore, the dissent generally rested its hat on the claim that making notes legal tender was legitimate as it was incidental to the power to carry on war. Of course that argument would not stand today in times of peace. It becomes our duty, therefore, to determine whether the Act of February 25, 1862, so far as it makes United States notes a legal tender in payment of debts contracted prior to its passage, is constitutional and valid or otherwise. Under a deep sense of our obligation to perform this duty to the best of our ability and understanding, we shall proceed to dispose of the case presented by the record. power of making notes a legal tender in all payments is claimed under the Constitution. Now how far is the government helped by this means? Certainly it cannot obtain new supplies or services at a cheaper rate, for no one will take the notes for more than they are worth at the time of the new contract. The price will rise in the ratio of the depreciation, and this is all that could happen if the notes were not made a legal tender. But it may be said that the depreciation will be less to him who takes them from the government if the government will pledge to him its power to compel his creditors to receive them at par in payments. This is, as we have seen, by no means certain. If the quantity issued be excessive and redemption uncertain and remote, great depreciation will take place; if, on the other hand, the quantity is only adequate to the demands of business and confidence in early redemption is strong, the notes will circulate freely whether made a legal tender or not. But if it be admitted that some increase of availability is derived from making the notes a legal tender under new contracts, it by no means follows that any appreciable advantage is gained by compelling creditors to receive them in satisfaction of preexisting debts. And there is abundant evidence that whatever benefit is possible from that compulsion to some individuals or to the government is far more than outweighed by the losses of property, the derangement of business, the fluctuations of currency and values, and the increase of prices to the people and the government, and the long train of evils which flow from the use of irredeemable paper money. It is true that these evils are not to be attributed altogether to making it a legal tender. But this increases these evils. It certainly widens their extent and protracts their continuance. inconsistent can be regarded as appropriate, or plainly adapted, or really calculated means to any end. Let us inquire, then, first whether making bills of credit a legal tender, to the extent indicated, is consistent with the spirit of the Constitution. It is true that this prohibition is not applied in terms to the government of the United States. Congress has express power to enact bankrupt laws, and we do not say that a law made in the execution of any other express power, which, incidentally only, impairs the obligation of a contract can be held to be unconstitutional for that reason. But we think it clear that those who framed and those who adopted the Constitution intended that the spirit of this prohibition should pervade the entire body of legislation, and that the justice which the Constitution was ordained to establish was not thought by them to be compatible with legislation of an opposite tendency. In other words, we cannot doubt that a law not made in pursuance of an express power, which necessarily and in its direct operation impairs the obligation of contracts, is inconsistent with the spirit of the Constitution. taken for the benefit of a part without violating the spirit of the prohibition. It is not doubted that all the provisions of this amendment operate directly in limitation and restraint of the legislative powers conferred by the Constitution. The only question is whether an act which compels all those who hold contracts for the payment of gold and silver money to accept in payment a currency of inferior value deprives such persons of property without due process of law. It is quite clear that whatever may be the operation of such an act, due process of law makes no part of it. Does it deprive any person of property? A very large proportion of the property of civilized men exists in the form of contracts. These contracts almost invariably stipulate for the payment of money. And we have already seen that contracts in the United States, prior to the act under consideration, for the payment of money were contracts to pay the sums specified in gold and silver coin. And it is beyond doubt that the holders of these contracts were and are as fully entitled to the protection of this constitutional provision as the holders of any other description of property. But it may be said that the holders of no description of property are protected by it from legislation which incidentally only impairs its value. And it may be urged in illustration that the holders of stock in a turnpike, a bridge, or a manufacturing corporation, or an insurance company, or a bank, cannot invoke its protection against legislation which, by authorizing similar works or corporations, reduces its price in the market. But all this does not appear to meet the real difficulty. In the cases mentioned, the injury is purely contingent and incidental. In the case we are considering, it is direct and inevitable. If in the cases mentioned, the holders of the stock were required by law to convey it on demand to anyone who should think fit to offer half its value for it, the analogy would be more obvious. No one probably could be found to contend that an act enforcing the acceptance of fifty or seventy-five acres of land in satisfaction of a contract to convey a hundred would not come within the prohibition against arbitrary privation of property. We confess ourselves unable to perceive any solid distinction between such an act and an act compelling all citizens to accept, in satisfaction of all contracts for money, half or three-quarters or any other proportion less than the whole of the value actually due, according to their terms. It is difficult to conceive what act would take private property without process of law if such an act would not. 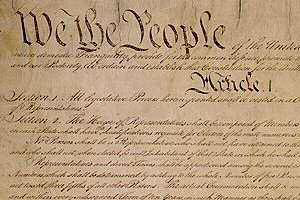 We are obliged to conclude that an act making mere promises to pay dollars a legal tender in payment of debts previously contracted, is not a means appropriate, plainly adapted, really calculated to carry into effect any express power vested in Congress, that such an act is inconsistent with the spirit of the Constitution, and that it is prohibited by the Constitution. and now concur in those which we have just announced. These conclusions seem to us to be fully sanctioned by the letter and spirit of the Constitution. We are obliged, therefore, to hold that the defendant in error was not bound to receive from the plaintiffs the currency tendered to him in payment of their note, made before the passage of the Act of February 25, 1862. It follows that the judgment of the Court of Appeals of Kentucky must be affirmed. so far as it makes United States notes a legal tender for such debts, is not warranted by the Constitution. The very day of the Hepburn decision, President Grant appointed two new Justices whose job it was to legalize paper money. Bradley and Strong are thus those two men who are responsible for the entire existence of paper money as we know it today. The holding in the Hepburn case was explicitly overruled by Knox v. Lee and other Legal Tender Cases, 79 U.S. (Wall. 12) 457 (1871), in which Chief Justice Chase dissented. Yet what is fascinating is that the Supreme Court stated that Congress has no authority to debase the currency as they do with inflation. For, 1st. Congress has no power given it to regulate the value of the money it borrows, but only of the money it coins, and of foreign coins. The analogy claimed would exist if the Constitution gave Congress power to borrow [79 U.S. 457, 468] money and regulate the value thereof. But that it does not give. And, 2d. Congress has no power to even materially debase the coin. A power to regulate is not a power to destroy. Here we might stop; but we will notice briefly an argument presented in support of the position that the unit of money value must possess intrinsic value. The argument is derived from assimilating the constitutional provision respecting a standard of weights and measures to that conferring [79 U.S. 457, 553] the power to coin money and regulate its value. It is said there can be no uniform standard of weights without weight, or of measure without length or space, and we are asked how anything can be made a uniform standard of value which has itself no value? This is a question foreign to the subject before us. The legal tender acts do not attempt to make paper a standard of value. We do not rest their validity upon the assertion that their emission is coinage, or any regulation of the value of money; nor do we assert that Congress may make anything which has no value money. What we do assert is, that Congress has power to enact that the government’s promises to pay money shall be, for the time being, equivalent in value to the representative of value determined by the coinage acts, or to multiples thereof. It is hardly correct to speak of a standard of value. The Constitution does not speak of it. It contemplates a standard for that which has gravity or extension; but value is an ideal thing. The coinage acts fix its unit as a dollar; but the gold or silver thing we call a dollar is, in no sense, a standard of a dollar. It is a representative of it. 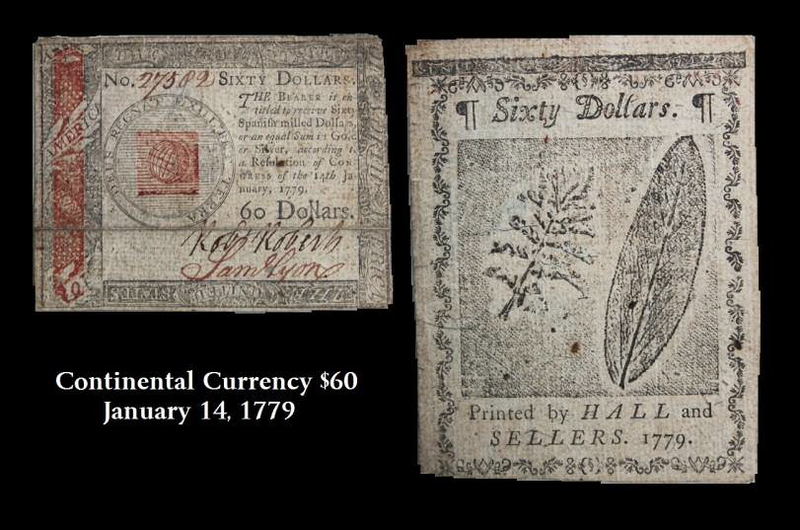 There might never have been a piece of money of the denomination of a dollar. There never was a pound sterling coined until 1815, if we except a few coins struck in the reign of Henry VIII, almost immediately debased, yet it has been the unit of British currency for many generations. It is, then, a mistake to regard the legal tender acts as either fixing a standard of value or regulating money values, or making that money which has no intrinsic value. But, without extending our remarks further, it will be seen that we hold the acts of Congress constitutional as applied to contracts made either before or after their passage. it is critical to understand that the Supreme Court in ruling that Congress has the power to create paper money and replace coin even though the Constitution did not provide such an express power, The Legal Tender Cases reversed Hepburn, beginning with Knox v. Lee. 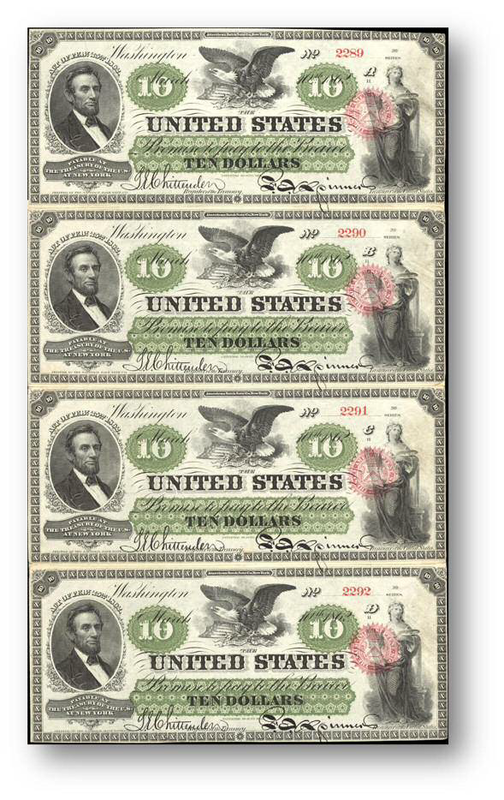 Thereafter, in Juilliard v. Greenman, 110 U.S. 421 (1884), the United States Supreme Court ruled that Congress had the right to issue notes to be legal tender for the payment of public and private debt. Legal-tender notes are Treasury notes or bank notes that, in the eyes of the law, must be accepted in the payment of debts. This raises the question about Congress authority to then delegate that power to the Federal Reserve. Without question, the Legal Tender Act of 1862, 12 Stat. 345, enacted February 25, 1862, was unconstitutional. 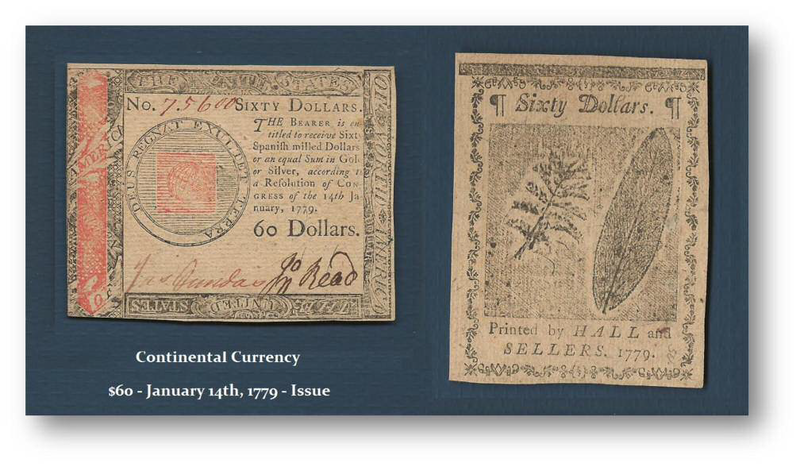 For Congress to issue legal tender paper currency, it had to have Amended the Constitution. By putting political hacks on the bench of courts, the Federal Government can eliminate the Constitution entirely with sophistry. Congress sought to issue paper money to finance the Civil War without raising taxes. 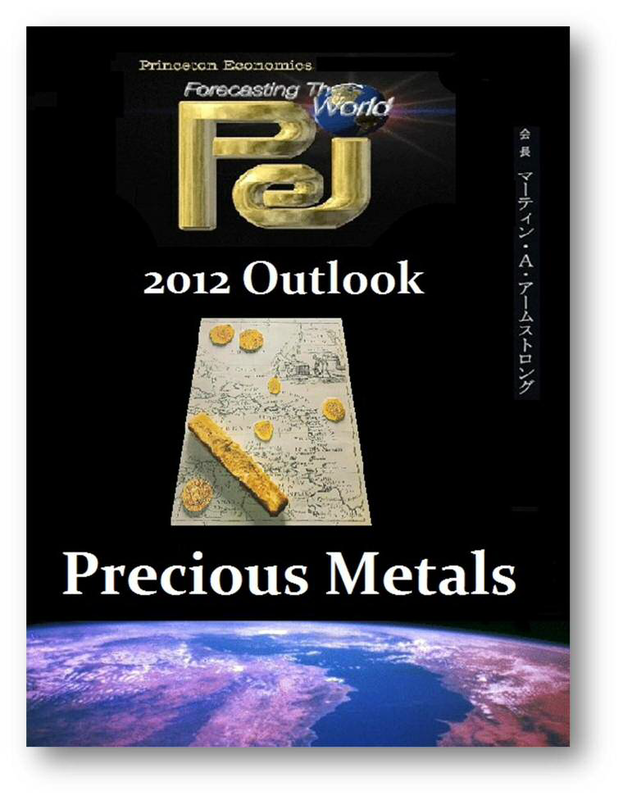 The paper money depreciated in terms of gold and became the subject of controversy, particularly because debts contracted earlier could be paid in this cheaper currency. Article I, Section 10 of the Federal Constitution explicitly forbids the states from issuing “bills of credit” or its own currency or making anything but gold and silver coin “legal tender”. It makes no sense to allow the Federal Government to do so and to debase the coinage and paper money once issued. The Tenth Amendment refers to reserved powers that only the states can exercise, as well as powers not delegated that continue to reside in the people. Article I, Section 8 of the Constitution specifically gives Congress power to “borrow money” and also power to “coin money” and “regulate the value” of both U.S. and foreign coins, and regulate interstate commerce. 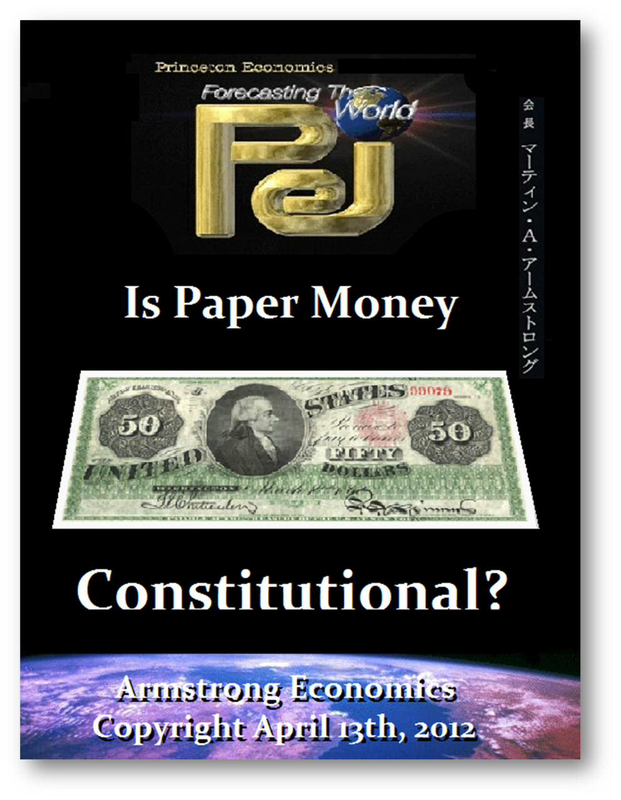 Nonetheless, the Constitution does not explicitly and unambiguously grant Congress the power to print paper money, to destroy the money through debasement (inflation), or make whatever it desires legal tender. Unfortunately, you really expect a federal judge to outlaw paper money is just unrealistic. Nonetheless, this illustrates the entire problem with courts that are stacked by politicians who are career employees. They will always, and without exception, rule in favor of government. You cannot obtain a real or fair individual determination in the United States today. Even the legal of taxation any the whole Marxist approach of taxing the rich at a greater percentage than everyone else. That defies the Equal Protection of the Law provision. Judge Robert Bork has in his hearings for appointment to the Supreme Court stated: “Scholarship suggests that the Framers intended to prohibit paper money. Any judge who thought today he would go back to the original intent really ought to be accompanied by a guardian rather than be sitting on a bench.”( Hearings Before Senate Committee on the Judiciary,100th Congress, 1st Session, Nomination of Robert H. Bork to be Associate Justice of the Supreme Court of the United States (1987). ). That intent was exemplified during the Constitutional Convention where, on August 16, 1787, in a vote of 9 to 2, the power to “emit bills of Credit” was stripped from the enumerated powers of Congress, listed in a draft version of the US Constitution. The original text of the August 6, 1787 read “The Legislature of the United States shall have the power … To borrow money, and emit bills on the credit of the United States”. The recordings of the debates over the Constitution make is very clear that because of the hyperinflation experienced during the Colonial period, the Founding Fathers were expressly prohibiting both DIRECT TAXATION as well as the DENIAL OF ANY RIGHT TO ISSUE PAPER MONEY as an alternative to borrowing. In the first instance, the Congress choose to follow Karl Marx and introduced the income tax moving for a Constitutional Amendment to grant that over-overruling and disregarding the wisdom of the Founding Fathers. In the case of the latter, they simply replace two judges on the Supreme Court who altered the Constitution. Unfortunately, we have no recourse to deal with judges for they are outside of every democratic safeguard intended by the Revolution and will always remain the greatest threat to our liberty. 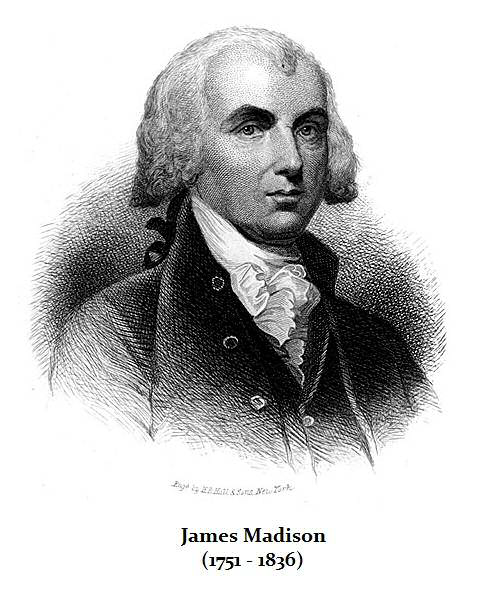 James Madison’s notes, from the Constitutional Convention in 1787, also include a footnote where he says that the Constitution would allow the federal government to make “use of public notes as far as they could be safe & proper“, but he makes clear that would not allow the federal government to use paper as currency or legal tender. There is no confirmation that this was more than his understanding what took place at the Convention. It is within this context that we must question what Congress has done by allocating authority of the money supply to the Federal Reserve. However, to whom does one complain? A judge? Good luck!